Review written by Jen, an expert CBD reviewer at CBD School. One of the best things about doing reviews here at CBD School is the plethora of new products we get to sample on a regular basis. New products hit the market all the time, and in a market that’s as competitive as the CBD space, most companies entering into the marketplace are doing their best to be different than the rest. This is exactly what we found with Pure Relief. 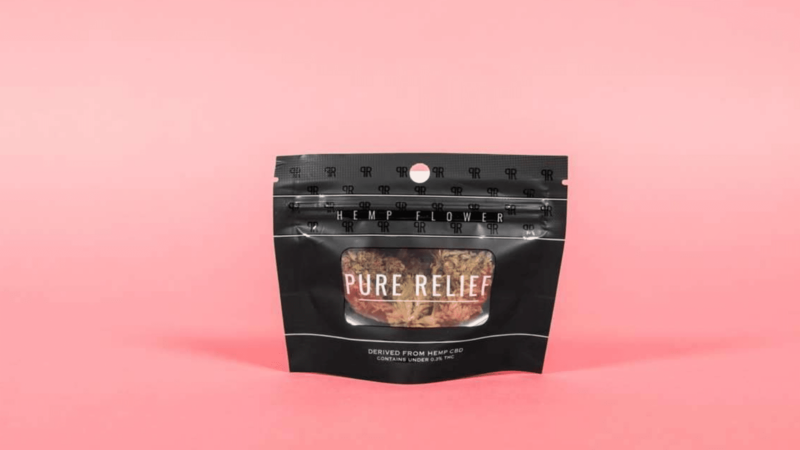 Yes, Pure Relief offers your standard CBD tincture, gummies, topical, and pet products…but they’re also doing something far different than what we’ve ever seen by offering a selection of hemp flower. 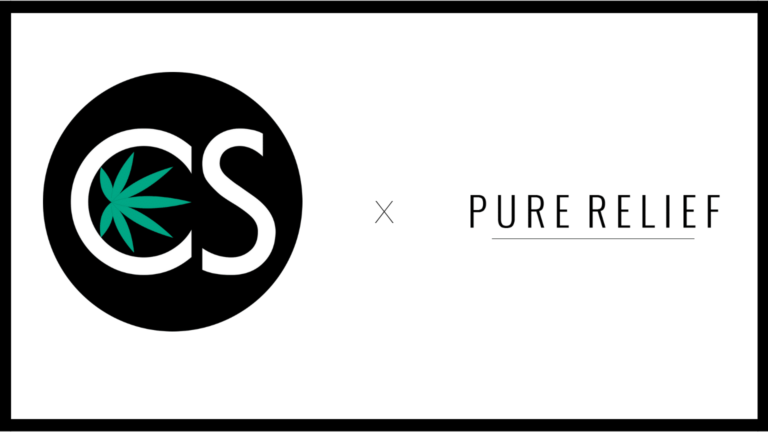 If you’re into smoking CBD, Pure Relief is definitely a company you’re going to want to check out. Here’s our honest take on what we tried. Our experience of Pure Relief was with their Select Sample Pack ($15.00). Not sure if CBD is the best option for you? Pure Relief has made it easy by offering an affordable option of trying out some of their most popular products. Let’s start with pre rolls…because they seriously made my life that much better. Edit: the sample pack doesn’t seem to be available anymore. But need not worry – click here to grab Pure Relief Prerolls or any of their other products. There’s also a bunch of other great bundles in the Pure Relief Bundles section of their website. I’m going to be honest about something. I recently quit smoking cigarettes after almost 30 years of smoking. I’m well aware of the benefits of vaping CBD to help quit smoking, which was something that helped me immensely (along with 7mg nicotine patches and 2mg pieces of nicotine gum) for the first month I was in cigarette cessation. After month two, I decided it would be a good time to truly offer my lungs the healing they deserve by taking a break from smoking cannabis as well. Anyone who regularly consumes cannabis knows that a tolerance break can be a welcomed change from time to time. Let’s just say it was past time. After 10 days of not smoking weed and 60+ days of not smoking cigarettes, I received my Select Sample Pack from Pure Relief. As someone who’s always enjoyed smoking, I was excited to try their CBD prerolls. It would be the first time of actually smoking CBD flower (I’ve vaped a ton but never tried flower). Not only did the preroll satisfy that urge to smoke…but super mellowed me out without making me feel stoned. It was like the all the relaxing yet uplifting attributes of CBD (and what I love about THC) completely without the high. Pure Relief Prerolls will 100% become one of the products I order on the reg. What about what else was sampled? Also included in the Select Sample Pack was a sample size of their 1000mg Full Spectrum Oil. These sample sizes (as well as everything else in the Sample Pack) is also available individually in Pure Relief’s online store. Sample sizes are an affordable way to try CBD. The 1000mg sample sizes are available in mint and regular. We received the mint flavor. And while yes, it’s minty, it also tastes VERY earthy. We’re accustomed to the flavor of CBD oils that are more natural (it’s actually something I prefer), but not everyone enjoys an oil that tastes like straight weed oil, even if it does have a hint of mint. If you’re interested in the regular sizes of their CBD Oil Tinctures, they are available in 500mg ($40/regular, $50/mint), 1000mg ($75/regular, $85/mint), 2500mg ($150), and 5000mg ($215) at the time of writing. Back, neck, and shoulder pain is something that most of us that sit in front of a computer for work all day are all too familiar with. This is one of the reasons I’m adamant about always having some sort of CBD topical cream near me at all times. I’ve found most offer the relief all of us could probably use. Pure Relief Topical Cream ($50) didn’t disappoint. We tried the sample size (which was included in our Starter Sample Pack). These topicals can all be purchased individually as well. Rubbed deeply into our problem areas, we found it significantly reduced the chronic pain we unfortunately experience on a regular basis. Whether it’s a pain in your neck, you’ve got a bad knee, inflammation caused by arthritis, or are just plain sore from a serious workout, we can confidently recommend Pure Relief Topical Cream. 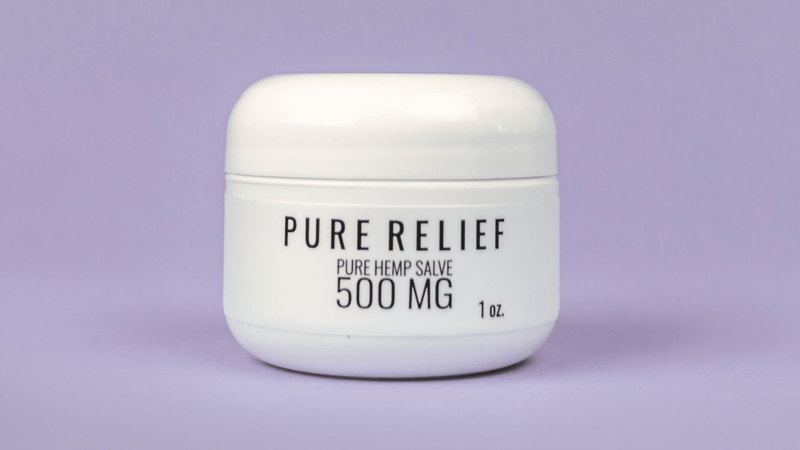 As far as CBD gummies go, Pure Relief is offering one of the better we’ve tried. They’re coated with sugar crystals and don’t stick together, which we’ve found isn’t always the case when it comes to CBD gummies. The taste was good, without any earthly hint of flavor whatsoever. Pure Relief CBD Gummies ($60) are gluten-free, non-GMO, sweetened with organic cane juice, organic corn syrup, and organic white grape juice, and made without the use of any artificial colors or flavors. 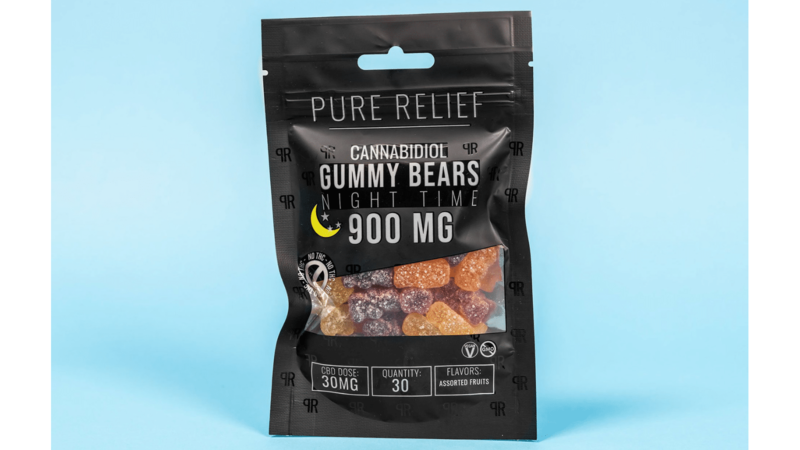 Pure Relief also offers a Nighttime CBD Gummy Bear (also $60) that we didn’t try. On their website, it says that their CBD nighttime gummies are infused with melatonin, but it didn’t specify how many milligrams of melatonin each gummy contains. If you have trouble sleeping and enjoy CBD edibles, this could be a solid option to try about an hour before going to bed, but we can’t make any promises. You can learn more about Pure Relief by listening to our podcast with them. We love to see companies going above and beyond in the world of CBD. We regularly review several companies and know just how important it is to stand out in a market where new companies come out almost every day. What really stood out to us about Pure Relief is that they’re a company that’s really doing things different. 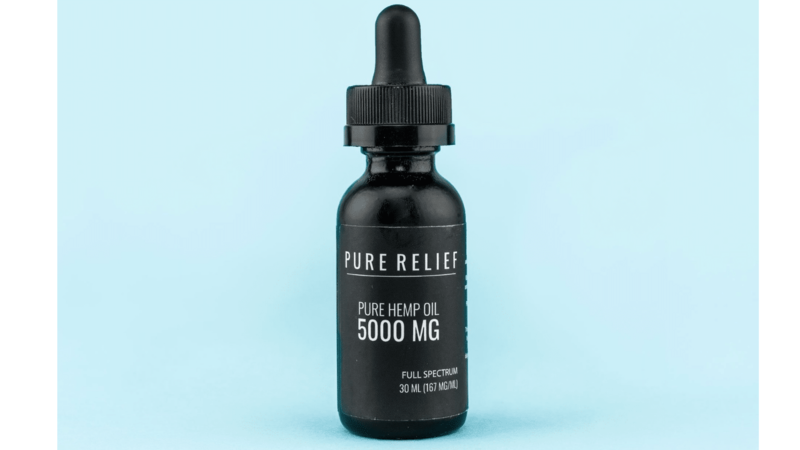 Aside from one of the few CBD companies we’ve seen that offers hemp flower (thank you, Pure Relief), they’re the only one we’ve seen that offers sample sizes. At $2 or $3 a pop (or $15 for the bundle), it’s an option to try out their products without breaking the bank. Don’t love what you tried? No big deal. You’re only out a few bucks. Love what you tried? Perfect. Order more at a price comparable to other brands on the market and be confident you’re getting something you’ll enjoy. Pure Relief also offers a few different CBD Starter Kits. Here you’ll find 5 different bundles at an affordable price. There’s both products there for both pets and humans. Speaking of furry friends, Pure Relief also offers a Pet Relief Tincture 150mg ($25). While our dogs weren’t fortunate enough to try it, if their pet products are any indication of the other products we tried, we’re sure our two dogs would wag their tails in appreciation. When it comes down to it, Pure Relief is a company we’re convinced is one we’ll come back to again and again. We’re pleased with their overall approach to business in general. Not only is their website easy to navigate, but it’s got a classy, simple, refreshing feel that we can appreciate. In today’s CBD market, companies have got to have all their bases covered if they want to succeed. And although they’re new to the scene, we’re pretty sure success is something Pure Relief is going to experience.